An iconic high-rise tower is coming soon to the Coal Harbour community in Downtown Vancouver. 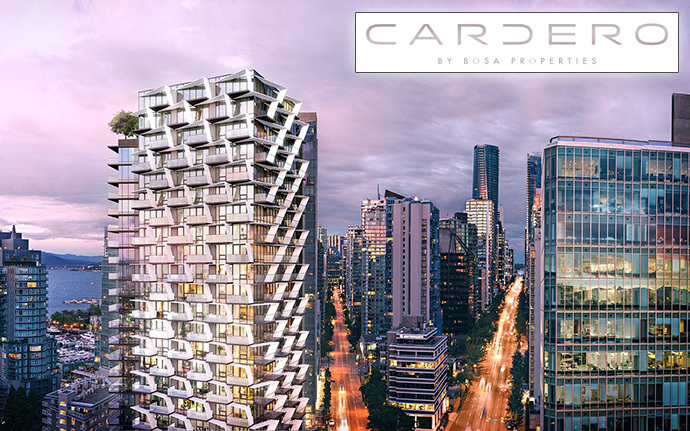 Cardero by Bosa Properties is located at the corner of Cardero Street and Georgia Street and presales are expected to launch in Summer 2016. Situated in one of Vancouver’s most exclusive urban communities, the Coal Harbour Cardero Condos by Bosa will feature award winning architecture designed by world renowned Henriquez Partners Architects. The 26 storey landmark tower will have a modern façade that is unique with a series of angular sun shades that appear to float horizontally across both the west and south sides of the building. The eye catching architecture not only provides shade but also enhances residence privacy and reduces solar gain during the summer months. 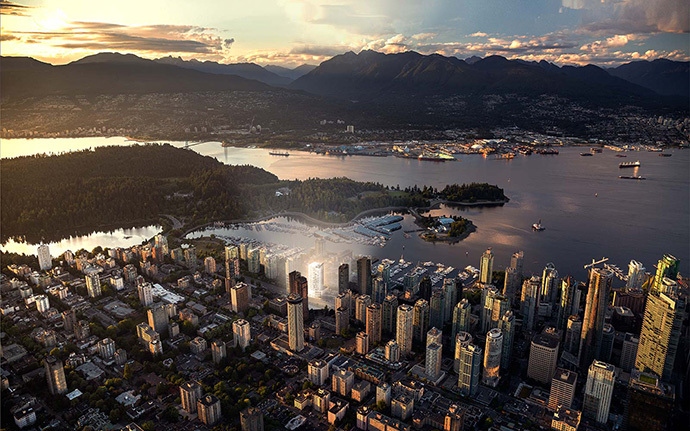 Located at the gateway to downtown and Coal Harbour, the Cardero condos by Bosa Properties will feature only 116 high-rise residences for sale that will provide light-filled interior spaces, great views and an exceptional level of finishing. The anticipated starting price point is around $1,500 per square foot and the Cardero floor plans will range from spacious 1 bedroom to family sized 3 bedroom suites. The higher level residences will also feature panoramic views to the North Shore mountains and water as well as to Stanley Park to the west. According to their marketing: Picture life in Coal Harbour, Downtown Vancouver’s most iconic neighbourhood – steps from the legendary seawall, moments from Stanley Park. Out of this extraordinary setting rises Cardero by Bosa Properties, a limited collection of 119 bespoke luxury residences, raising the bar for architecture and innovation in Canada. 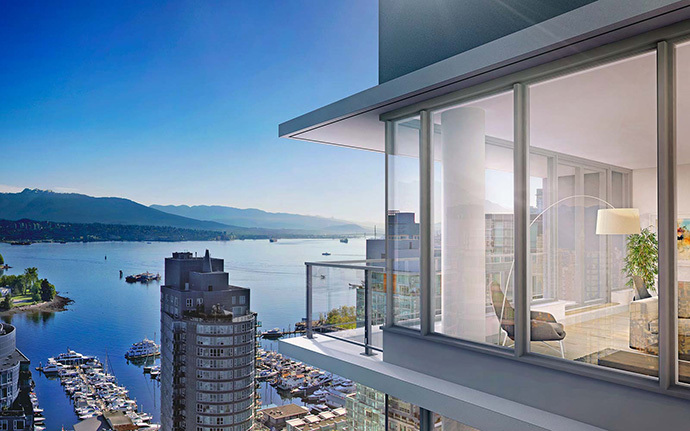 The luxury Cardero Vancouver condos will be available this summer. The estimated completion date will be in the Fall or Winter of 2019. The project site is located at 1575 West Georgia Street, Vancouver and 620 Cardero Street Vancouver (which is immediately adjacent to Facebook’s Vancouver office). Please visit www.bosaproperties.com today for more details as they are released or if you require representation, please register your interest at the top of this page. The Cardero condos in downtown Vancouver feature luxury interior finishes that include rich and solid hardwood floors, extensive use of natural materials and kitchens designed with contemporary matte Dornbracht faucets, state of the art retractable downdraft venting, integrated spice racks, Miele induction cooktops and beautiful flat panel cabinetry. 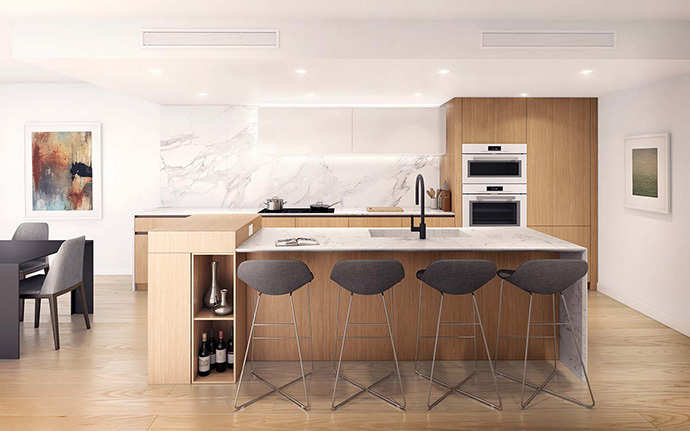 The bespoke kitchens at the Bosa Cardero Vancouver condos are beautifully designed with one of a kind finishes that are specific only to this high-rise tower. 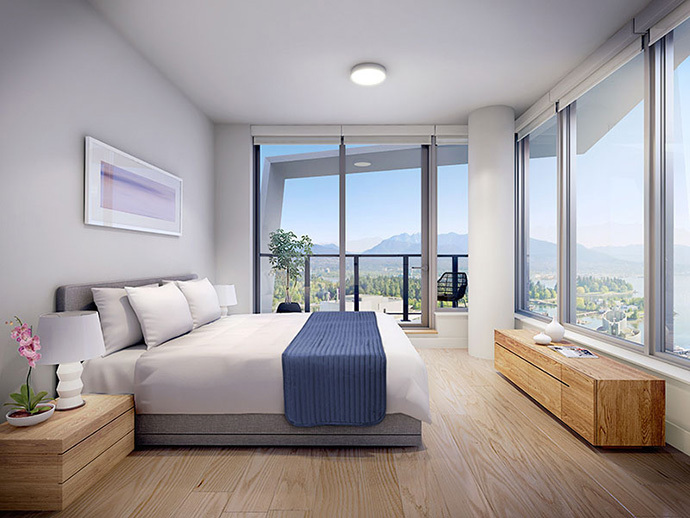 The homes will feature air conditioning, expansive windows featuring impressive views of Burrard Inlet, the North Shore Mountains and English Bay from some upper residences. There are also three distinct housing types available at the presale Vancouver Cardero condos by Bosa Properties beginning with the Tower Collection at Cardero. These are one and two bedroom condominium homes. 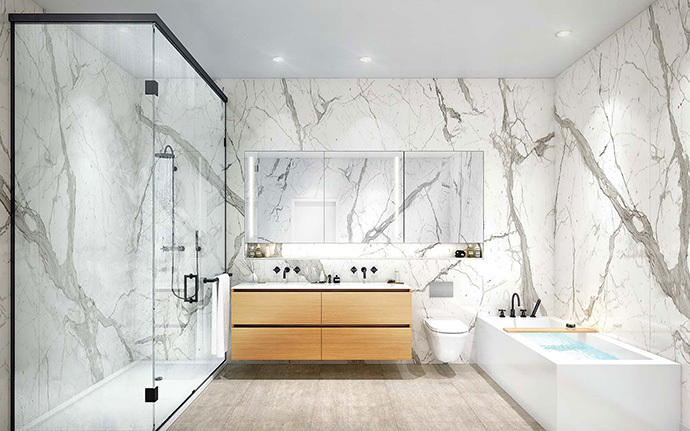 The second set of homes belong to the Coal Harbour Collection at Cardero Vancouver condos and they include spacious two and three bedroom floor plans that start from an impressive 1,100 square feet in interior living space. The most exclusive homes belong to the Estate Homes at The Cardero tower which are the penthouses and sub-penthouses that range in size between approximately 1,200 to over 2,500 square feet plus outdoor living space. 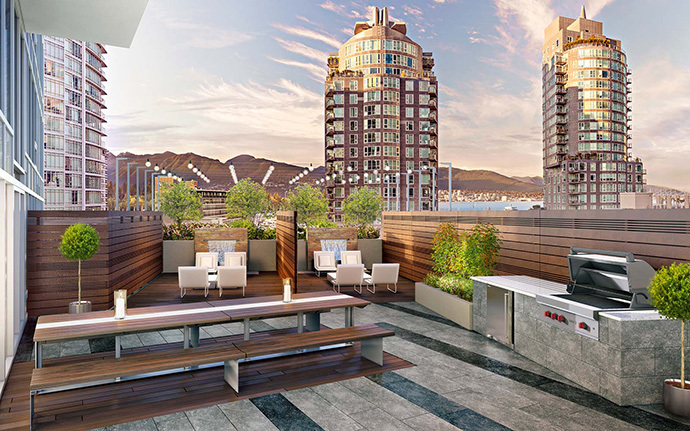 In addition, the Coal Harbour Cardero condos feature on-site amenities that are unparalleled. Located on the sixth floor podium, the Cardero by Bosa Properties features a state of the art fitness centre, indoor and outdoor cooking and dining areas, a barbeque deck plus comfortable outdoor lounge space. There is also a party room/lounge and a common rooftop terrace. The Cardero Coal Harbour condos will also feature a common courtyard and garden plots in addition to a concierge, underground secured parking and security fob access to common areas. The location of this iconic tower is exceptional. Residents will be just minutes away from the famous Seawall where you can walk, cycle, rollerblade or run. Stanley Park and the rest of downtown Vancouver are just steps away as are shopping districts, community centres, restaurants, galleries and coffee shops. Coal Harbour is known to be one of the most walkable neighbourhoods. You’re also just minutes from Lion’s Gate Bridge that connects you to the North Shore and a short walk to Waterfront Station that provides easy access to 3 SkyTrain Lines, the West Coast Express Train to the Tri-Cities, SeaBus to Lonsdale Quay in North Vancouver and bus routes. The layouts at the Bosa Cardero condo project will feature floor plans between 443 square feet to 1,545 square feet (subject to change at any time). It’s expected that the ground floor will have prime retail space and the first three lower floors will be office space. The remaining floors will be all residential and the tower will be approximately 265 feet in height. 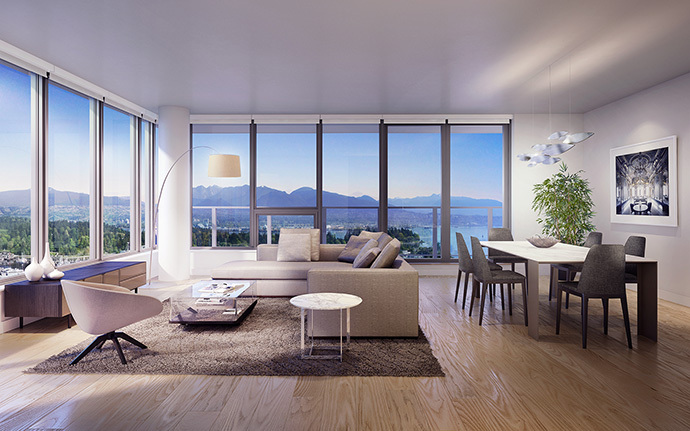 The Cardero condos in Vancouver will also be built to LEED Gold certification standards. The developer of Cardero is Bosa Properties and the architectural firm selected is Henriquez Partners Architects. BYU Design has been engaged for the interior design of the units. Deposit Structure for Cardero by Bosa is $50,000 upon presentation of the offer, increasing to 10% of the purchase price before the expiry of the rescission period. 5% upon filing of the amendment to disclosure statement. 5% invested six month following the second deposit. 5% invested six months following the third deposit. Designed to blur the defining line between structure and sculpture, Cardero Vancouver condos turn heads and creates an eye-catching landmark for Coal Harbour. Bold yet elegant, it’s the cornerstone of a new district celebrating architecture and design. Prominently located at the intersection of Georgia, Pender, and Cardero Streets, this landmark tower’s deliberate design forms an illustrious gateway that connects Vancouver’s most notable neighbourhoods.